X Its long tongue, slathered with a gooey saliva, sticks to anything, so it is very useful. X Sa longue langue sécrète une salive gluante qui se colle à n’importe quoi. Elle est très efficace ! X Su larga lengua, recubierta de saliva pegajosa, se pega a todo, por lo que es muy útil. X La lunga lingua intrisa di saliva appiccicosa si attacca agli oggetti e può diventare molto utile. X 긴 혀는 끈적끈적한 침으로 덮여 있다. 어떤 것이든 달라붙어서 매우 편리하다. Y Its tongue is twice the length of its body. It can be moved like an arm for grabbing food and attacking. Y Sa langue fait deux fois la taille de son corps. Il l’utilise comme un bras pour saisir de la nourriture mais aussi pour attaquer. Y La lengua es tan larga que duplica su altura. Es útil porque puede moverla para agarrar comida y atacar. Y La sua lingua è lunga il doppio del corpo. La usa come un braccio per afferrare cibo e attaccare. Y 혀가 키의 2배나 된다. 먹이를 잡거나 공격을 할 때면 마치 손처럼 움직인다. 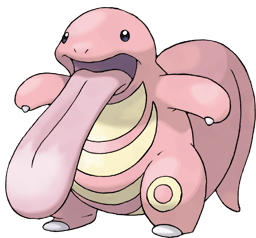 Omega Ruby Whenever Lickitung comes across something new, it will unfailingly give it a lick. It does so because it memorizes things by texture and by taste. It is somewhat put off by sour things. Omega Ruby Wenn Schlurp etwas Neues entdeckt, leckt es daran. Es merkt sich Gegenstände anhand der Struktur und des Geschmacks. Saure Sachen schrecken es eher ab. Omega Ruby Chaque fois qu’Excelangue découvre quelque chose de nouveau, il le lèche. Sa mémoire est basée sur le goût et la texture des objets. Il n’aime pas les choses acides. Omega Ruby Cada vez que Lickitung se encuentra con algo que no conoce, le da un lametazo. Es la forma que tiene de memorizar las cosas, por la textura y el sabor. No soporta los sabores ácidos. Omega Ruby Quando Lickitung si trova di fronte a qualcosa di nuovo, istintivamente lo assaggia con una leccata. È dotato infatti di una memoria legata al gusto e alla consistenza degli oggetti. Non ama i sapori aspri. Omega Ruby 처음 본 것은 반드시 핥아본다. 혀의 감촉과 맛으로 기억해두는 것이다. 하지만 시큼한 것을 핥는 것은 조금 꺼린다. Alpha Sapphire Whenever Lickitung comes across something new, it will unfailingly give it a lick. It does so because it memorizes things by texture and by taste. It is somewhat put off by sour things. Alpha Sapphire Wenn Schlurp etwas Neues entdeckt, leckt es daran. Es merkt sich Gegenstände anhand der Struktur und des Geschmacks. Saure Sachen schrecken es eher ab. Alpha Sapphire Chaque fois qu’Excelangue découvre quelque chose de nouveau, il le lèche. Sa mémoire est basée sur le goût et la texture des objets. Il n’aime pas les choses acides. Alpha Sapphire Cada vez que Lickitung se encuentra con algo que no conoce, le da un lametazo. Es la forma que tiene de memorizar las cosas, por la textura y el sabor. No soporta los sabores ácidos. Alpha Sapphire Quando Lickitung si trova di fronte a qualcosa di nuovo, istintivamente lo assaggia con una leccata. È dotato infatti di una memoria legata al gusto e alla consistenza degli oggetti. Non ama i sapori aspri. Alpha Sapphire 처음 본 것은 반드시 핥아본다. 혀의 감촉과 맛으로 기억해두는 것이다. 하지만 시큼한 것을 핥는 것은 조금 꺼린다. Red Its tongue can be extended like a chameleon's. It leaves a tingling sensation when it licks enemies. Blue Its tongue can be extended like a chameleon's. It leaves a tingling sensation when it licks enemies. Yellow Its tongue spans almost 7 feet and moves more freely than its forelegs. Its licks can cause paralysis. Stadium Its tongue, twice its body's length, moves around freely to catch prey. Its licks cause a tingling sensation. Gold Its tongue has well-developed nerves that run to the very tip, so it can be deftly manipulated. Silver Its long tongue, slathered with a gooey saliva, sticks to anything, so it is very useful. Stadium2 Its tongue has well-developed nerves that run to the very tip, so it can be deftly manipulated. 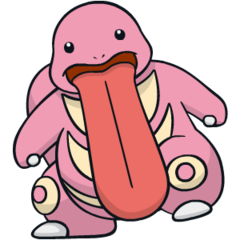 Ruby Whenever Lickitung comes across something new, it will unfailingly give it a lick. It does so because it memorizes things by texture and by taste. It is somewhat put off by sour things. Sapphire Whenever LICKITUNG comes across something new, it will unfailingly give it a lick. It does so because it memorizes things by texture and by taste. It is somewhat put off by sour things. Emerald Whenever it sees something unfamiliar, it always licks the object because it memorizes things by texture and taste. It is somewhat put off by sour things. Pearl Instead of hands, it uses its tongue, which is twice its height. Its sticky saliva grips anything. Platinum When it extends its over-six-foot- long tongue, its tail quivers. There is a possibility they are connected. Black When it extends its over-six-foot- long tongue, its tail quivers. There is a possibility they are connected. White When it extends its over-six-foot- long tongue, its tail quivers. There is a possibility they are connected. White 2 Being licked by its long, saliva-covered tongue leaves a tingling sensation. Extending its tongue retracts its tail.